The plucky house sparrow is one of the most widespread birds in the world, having been introduced in so many places that it is often considered an invasive species. Ironically, however, its population is experiencing serious decline in many of its native regions and conservation measures are necessary to protect this member of the Passeridae bird family from vanishing from its home range. This fact sheet can help birders not only recognize these birds, but better understand their needs and how to manage them where appropriate. Male and female house sparrows look distinctly different. Males have a black chin and bib, white cheeks, and a rust-colored cap and nape of neck. The black on the chin and breast can vary widely, with older, more dominant males showing more extensive black. The underparts are pale grayish, and the back and wings show brown and black streaking. The rump is gray. Males also have a single white wing bar. Females are plainer, with a broad buff eyebrow and brown and buff streaks on the wings and back. On both genders, the legs and feet are pale and the eyes are dark. Overall, both males and females have a stocky appearance. Juveniles resemble adult females but with less distinctive markings and a less defined eyebrow. House sparrows can be very vocal in large groups but are often quieter when isolated. Their calls include a fluttery “cheep” and rapid chattering sounds. Young birds may use a variety of soft begging calls to attract their parents' attention in the nest. House sparrows were first introduced to North America in the 1850s in an effort to control insect pests, but the effort backfired because these birds eat mostly grain, and their population grew rapidly thanks to extensive agriculture during that time period. Due to fast and prolific breeding and extensive food supplies, house sparrows have become one of the most widespread birds in southern Canada, the continental United States, Mexico, and Central America. They are highly adaptable to urban, suburban, and agricultural habitats but are rarely found far from human habitation. Worldwide, these birds are also common throughout Europe, Russia, and the Middle East, including India, though their numbers are declining in much of their native range in the Old World. House sparrows do not generally migrate but may become nomadic when seeking food sources. Where food remains abundant, including at backyard feeders, these birds will be found year-round. House sparrows congregate in large flocks to feed and roost, and bird colonies may be made up of several family flocks. These birds may become aggressive toward other birds feeding nearby and are bold around humans. These birds are generally granivorous and eat primarily seeds and grains. When their favored food sources are less abundant, they will sample a wide range of other foods, including fruit, suet, and insects. They typically forage on the ground, hopping and scratching with their feet, or hop about in trees and bushes while looking for insects. Being so used to humans has made house sparrows resourceful in finding unique food supplies. They have been seen inspecting car grills for insects, and will feed on farms searching for spilled seed and grain, even picking through piles of horse or cow dung. They will also visit compost piles and other unique options when looking for food. House sparrows are generally monogamous and build bulky nests in roof crevices, nesting boxes, and natural tree cavities, or they may chase other birds out of nests. The nest is usually composed of grass, twigs, straw, weeds, feathers, and similar material, but it will not be reused for additional broods. These birds lay oval-shaped eggs that are light green or bluish with small dark dots. The female house sparrow will incubate a brood of 4-6 eggs for 14-18 days, then both parents will regurgitate food for the nestlings for 14-18 days until the young birds leave the nest. Depending on the climate, mated house sparrow pairs may raise 2-3 broods per year, with multiple broods more common in areas with mild climates. While these sparrows are not considered threatened or endangered worldwide, they are experiencing varying degrees of population decline in their native range. Providing suitable nesting sites, food sources, and clean water, as well as discouraging feral cats, is essential to protect house sparrows, particularly in urban areas. 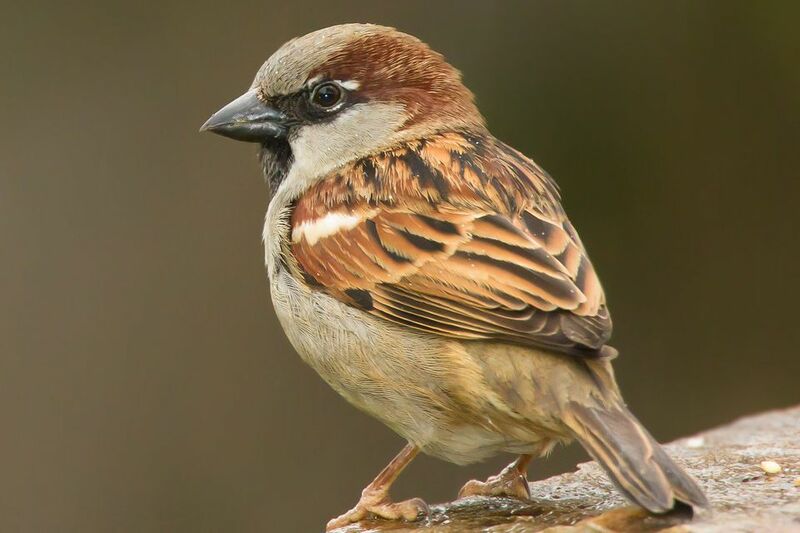 Different conservation organizations in Europe and India are making special efforts to promote house sparrow conservation, including offering tips for providing the best bird houses, preferred foods, and other necessities to protect these birds. For many backyard birders, particularly in North America, the challenge is not attracting house sparrows, but rather keeping them away because they are so abundant and aggressive, and may displace other birds such as bluebirds and purple martins. House sparrows will easily come to either platform or hopper feeders offering mixed seed, sunflower seeds, or cracked corn, and they frequently nest along the eaves of houses. These birds are some of the easiest for birders to find, especially in urban and suburban areas. House sparrows are commonly seen around buildings, especially grocery stores, schools, office complexes, and other areas that may not offer suitable habitat for other species. Even if there are only a few scattered trees or bushes, however, house sparrows can make use of them. House sparrows are only one of many small, brown birds that are often called "little brown jobs" because they can be difficult to tell apart at first glance. The house finch is often confused with the house sparrow, and birders will also want to learn about other North American sparrows and similar birds to be able to tell the difference between sparrows and finches. And don't forget to check out all our other detailed bird profiles to learn more about all your favorite species!